Sick of trying to get your kids to eat something healthy? Try my method of persuasion involving a stick. No, I'm not suggesting you beat the crap out of them. (I can hear the police sirens outside my door.) 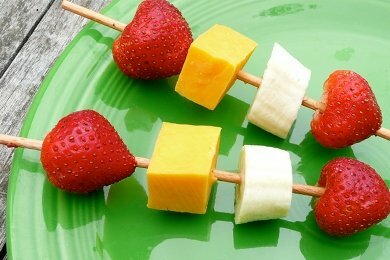 Try shoving a healthy food onto a stick! This may sound crazy (or even dangerous), but for a certain age group that can handle sticks this is a fantastic way to trick them into thinking they are getting a treat. I have even been to a party where they gave out apples stuck on popsicle sticks and kids went nuts. There was no caramel in sight, just an apple on a stick and my kids thought they had one the lottery. Children are much more motivated by the physical appearance of their food than adults. They choose things by sight, perhaps because they don't have the experiences that adults have had with food. For example, I love Brussels sprouts and my children will not touch them. I can remember not being so sure about Brussels sprouts and then I had them a few times, and now I love them. The best way to serve this snack is to get the kids involved so you don't have to do any work. Get some barbeque skewers and butter knives and let your children cut up the soft food. My 6 year old does great work with apples, cheese, bananas, chicken, etc. with a butter knife. Then give them the sticks and have them design their own snack. Let them pick out the food they want to use from the refrigerator. There are SO many options: olives, lunch meat, bread, fruit, vegetables, cheese - almost anything can be put on a stick! Your imagination is the only limitation for your fancy stick snack. You can wrap these in plastic wrap and put them in a lunch box. I would cut off the sharp end if you have a child that is a bit feisty at lunch time (you don't want his best friend to lose an eye). How do you dress up your snacks? Snack Girl - this is so true! We have a lot of summer parties and there are always a buch of kids at them. My friends and I have noticed that when we cut up a bunch of fruit and throw it in a bowl it mostly sits there. But when one of us cuts it up and puts it in a clear plastic cup with a spoon or fork they disappear very quickly! We also let them spray a little bit of whipped cream on it - you just have watch that because if you let them spray it themselves there is no portion control! Im from Mexico, and here we tend to eat spicy food, snacks, ice-cream, you name it, we eat it for sure. The snack-on-a-stick is very popular here, the bad thing is we have them filled up with "tamarindos" or tamarind (a fruit) thats spiced up and sadly also sweetened with loooots of sugar. Being the first place world-wide for obesity in children we really ought to be open-minded about the kind of food/snacks we feed our youth (and everyone else too). These healthy sticks are a much better option than the ones I have seen around, thanks a lot! What a great idea for lunchboxes! I'm always looking for lunch ideas. I bet toothpicks would work, as well, for smaller sizes to fit in a lunchkit. I've also seen pretzel sticks used in grocery stores that hand out food samples and that might work, too - makes for an edible stick for things like cheese or meat. Thanks for the inspiration! I started making what my friends call Bento box lunches (google it for great ideas like this)! We do use the skewers but another great idea I had was to go to the baking section at hobby lobby and get cupcake toothpicks and use those for seasons or occasions to make lunch fun! They sell plastic cupcake toppers that work great and are washable and reusable! Also I use silicone cupcake holders to hold the little pieces of food I cut out with little cookie cutters(reusable and green!) My daughter has gone from a very picky eater who left most of her lunch in her lunch box and was brought home spoiled to no eating everything that I send! Hey Snack Girl! I love your blog....and the great recipes, tips and lists. Would you consider a challenge from me? Can you make a top 10 healthy snack recipe list for kids....that doesn't include any peanut butter (allergy issue) or cheese(doesn't like)? I've tried substituting soy or almond nut butters....to no avail. The texture gets em every time! If you've never had peanut butter before....it is very unique. :-) Every "child-friendly" recipe book I see - once I throw out the peanuts & cheese? Well, there isn't much left. You're usually up for a good challenge!